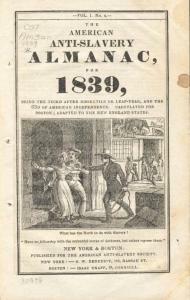 Almanacs were widely popular publications, read and used by the great majority of literate American adults. The Anti−Slavery Almanac was intended to instruct, persuade and horrify its readers about the evils of the American slave system and discrimination against people of color. Each of its 13 woodcuts—one for each of 12 months and one for the cover—presented an image of the evils of slavery and racism. THE NATION’S ACT. MAN AUCTION AT THE CAPITAL. A FREEMAN SOLD. As the District of Columbia was set apart to promote the interests and honor of the nation, its institutions should conform to the will of the nation. THEY DO. It is the nation’s will that any colored man in the District should be liable to arrest and imprisonment, without evidence, oath or warrent against him, on the simple pretence that he has been robbed of his liberty, and even when this has been virtually proved false, it is the nation’s will that he be sold to pay the cost of this cruelty. JOHN BULL’S MONARCHY A REFUGE FROM BROTHER JONATHAN’S SLAVERY. Facts. Our GOVERNMENT has tried to enslave many thousand persons who are enjoying their inalienable rights in Canada. May 10, 1828, the following resolution was adopted in the U.S. House of Representatives, and as appears from the journal without opposition, or the calling for the yeas and nays. Resolved, That the President of the U.S. be and he is hereby requested to open a negotiation with the British Government, in the view to obtain an arrangement whereby fugitive slaves who have taken refuge in the Canadian provinces of that Government, may be surrendered by the functionaries thereof to their masters, upon their making satisfactory proof of their ownership of said slaves.—Jour. H.R. 1 Sess. 20th Cong. pp. 715 and 720. A PRINTING PRESS DEMOLISHED AT SLAVERY’S BIDDING. COLORED SCHOLARS EXCLUDED FROM SCHOOLS. “If the free colored people were generally taught to read, it might be an inducement to them to remain in this country. WE WOULD OFFER THEM NO SUCH INDUCEMENT.”— Rev. Mr. Converse, a colonizationist, formerly of N.H., now editor of the Southern Religious Telegraph. In those parts of the country where the persecuting spirit of colonization has been colonized [that is, where the principles of colonization movement has been accepted], such exclusion has ceased. COLORED SCHOOLS BROKEN UP, IN THE FREE STATES. When schools have been established for colored scholars, the law−makers and the mob have combined to destroy them;—as at Canterbury, Ct., at Canaan, N.H., Aug. 10, 1835, at Zanesville and Brown Co., Ohio, in 1836. To be sanctioned by the free states if we admit Florida into the Union, while she cherishes a system which is both the offspring and parent of LYNCH LAW. A NORTHERN FREEMAN ENSLAVED BY NORTHERN HANDS. Nov. 20, 1836, (Sunday,) Peter John Lee, a free colored man of Westchester Co., N.Y., was kidnapped by Tobias Boudinot, E. K. Waddy, John Lyon, and Daniel D. Nash, of N.Y., city, and hurried away from his wife and children into slavery. One went up to shake hands with him, while the others were ready to use the gag and chain. See Emancipator, March 16, and May 4, 1837. This is not a rare case. Many northern freeman have been enslaved, in some cases under color of law. Oct. 26, 1836, a man named Frank, who was born in Pa., and lived free in Ohio, was hurried into slavery by an Ohio Justice of the Peace. When offered for sale in Louisiana, he so clearly stated the facts that a slaveholding court declared him FREE—thus giving a withering rebuke to northern servility. EMANCIPATED SLAVES CAN TAKE CARE OF THEMSELVES. TESTIMONY. “Since their freedom, the negroes cultivate habits of carefulness and economy.”— Mr. J. Howell. “There is an increasing attention paid by the negores to cultivating their private lands. They are very acute in making bargains.”— Dr. Daniell. “The negores show a great deal of shrewdness in every thing which concerns their own interests. To a stranger it must be utterly incredible how they can manage to live on such small wages. They are very exact in keeping their accounts with the manager.”— H. Armstrong, Esq. “The emancipated people manifest as much cunning and address in business, as any class of persons.”— Mr. James Howell. “The capabilities of the black for education are conspicuous; so also as to mental acquirements and trades.”— Hon. N. Nugent. A northern man goes south, sits at a table loaded from the slave’s unpaid toil,—who eats his corn bread in the sun,—marries a slaveholder, and then—finds out that slavery is a divine institution, and defends it in southern and northern pulpits, religious newspapers, For examples,—consult memory or observation. THE NATION ROBBING AN INDIAN CHIEF OF HIS WIFE. When monarchial Spain governed Florida, many slaves fled thither from republican oppression, and found shelter. One of them, having married an Indian chief, their FREEBORN daughter became the wife of Oceola. She was seized as a slave, in 1835, by a person, (who had probably never seen her,) holding the claim of her mother’s former master. Oceola attempted to defend his wife, but was overpowered and put in irons, by General Thompson, (our government agent,) who commanded the kidnapping party. What marvel that an Indian Chief, as he looked on his little daughter, and thought of his stolen wife, vowed vengeance on the robbers? A MINISTER ARRESTED FOR PREACHING AGAINST SIN. Dec. 14, 1835, Rev. George Storrs, who was invited to address the Anti−Slavery Society at Northfield, N.H., was dragged from his knees while at prayer by Sam’l Tilton deputy sheriff. He was also arrested in the pulpit, March 31, 1836, (fast day,) at Pittsfield, N.H., by the authority of a writ issued by Moses Norris, Esq., Gov. Isaac Hill sanctioned the outrage by reappointing Norris. Having driven colored people from school, we next DRIVE them to Liberia. “They sent out two shiploads of vagabonds that were COERCED away as truly as if it had been done with the cartwhip.”— R. J. Breckenridge, 1834. “I am acquainted with several, who informed me that they received SEVERAL HUNDRED LASHES to make them WILLING to go.”— Thomas C. Brown, from Liberia, 1834. “When emancipated, the slaves should be colonized in Africa, or somewhere else , WHETHER THEY BE WILLING OR NOT.”— Rev. T. Spicer, of the Troy (Meth.) Conference, Letter to Z. Watchman, Jan. 20, 1836. In 1836, when an agent of the society was attempting to colonize 65 emigrants from Ky. and Tenn. 22 of them escaped, (at Pittsburgh, and at N.Y.) not having been made “WILLING” to go. The American Anti−Slavery Almanac, for 1839 (Boston: Isaac Knapp), 7, 9, 11, 13, 15, 17, 19, 21, 23, 25, 27, 29. Edited by Old Sturbridge Village.